The library has developed an indoor skeleton of towering steel beams, thanks to the work of a framing foreman, Eric Greenhaogh, and his team. Greenhaogh has a tool belt wrapped around his waist, and his vibrant green vest is stained with dark streaks. He walks over to a box with chalk, which is used to define lines of future walls, and points to one of many streaks painted onto the dusty ground. A score of chalk marks the cutting-edge diagonal wall, infamous among the crew for its difficulty to execute. “All this stuff you see here is the layout of the walls that are gonna be [built],” Greenhaogh says. While students only see the black smoke and guarded fences of the construction site, a dedicated team of construction workers, architects and managers works until day’s end. Each has a different background but they all come together toward a common goal: to build a library that will serve as the creative space for many generations of Paly students to come. With piercing blue eyes and sharp charcoal eyeliner, MacKinnon’s tall figure commands the attention of any room she walks into. Coupled with her soft, calm voice, MacKinnon perfectly fits construction manager Charlie Diaz’s positive description of her — a highly capable asset to the team. MacKinnon speaks similarly of the construction team. PLANS FOR THE LIBRARY Architect Janet MacKinnon describes process of getting submittals, or shop drawings, approved. “Sometimes [I] get 20, 50 submittals all at the same time,” she says. Although she has faced gender discrimination while working in the field of architecture, MacKinnon uses these experiences as a way to grow and adapt. Leading the crew is construction manager Charlie Diaz, a man who wears an easy smile beneath his hard hat and a neon yellow vest over his work clothes. 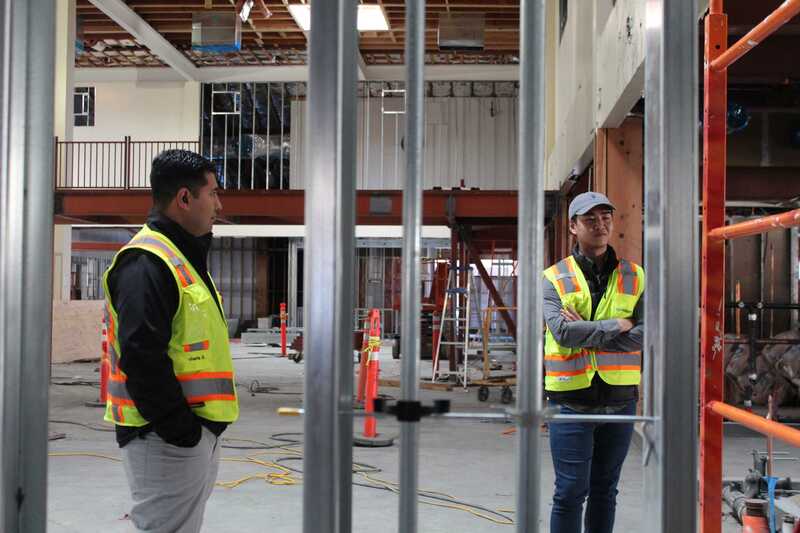 Although this is only Diaz’s second year in construction management, he worked in architecture for four years after receiving his bachelor’s in architecture. Diaz’s path to construction and design began long before he received his degree. Both his father and grandfather are architects, which impacted his decision to pursue architecture. Diaz’s father has been a major guiding figure for Diaz during his journey through community college, architecture school and in the industry. Construction manager Charlie Diaz details out what the future library will look like. When Diaz became the residential designer for a firm after its previous residential designer suddenly retired and left him with over 200 homes to permit and flip, Diaz’s father reassured him that he could do the job. Both of Diaz’s parents pushed him and his siblings to attend school and excel in whatever field they chose to pursue. “They always said ‘Whatever it is that you do, you’re either the best or you’re going to be part of something big,’” Diaz says. As the oldest of five children from a low-income background, Diaz’s best option for post-high school education was Harnell Community College in Salinas. “We didn’t have the ability to say ‘I’m going to go to a four-year way out here and expenses will be absolutely covered.’ Absolutely not, I had to work for everything,” he says. According to Diaz, community college provided him with the same classes his friends in four-year colleges were taking for a fraction of the price. For students interested in architecture and design, Diaz cautions them to make sure they’re pursuing architecture because of their passion for it, not for monetary gain. Only a handful of architects are able to achieve that coveted level of recognition and become “starchitects,” Diaz says. Greenhaogh was only a few years into college when his mother passed away. Suddenly, the opportunity to go to school vanished and he was forced to work. Since then, he has gotten married and now has kids. Greenhaogh works in construction to support his kids’ education, but says that he won’t let his son follow in his footsteps. He encourages his kids to find their passion instead of focusing on money.